Again, we are using controlled flowback to manage the production, limit pressure drawdown and maximize EURs. Our South Texas drilling team is able to drill and case these wells in 12 days for less than $3 million. We are seeing some relief in completion cost and expect the favorable trends to continue into 2013. The company expects pad drilling will drive total drilling and completion costs down to $8 million per well. Lower costs will help the company reach internal rates of return of more than 50% per well. That alone has prompted the company to invest more heavily in 2013. 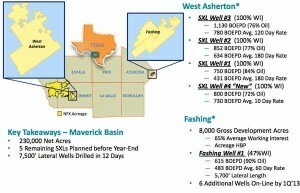 We will be increasing our planned development activities in the Eagle Ford and expect to drill as many as 35 wells. In addition, we will be working more than 200,000-plus net acre position into the economic window. Newfield's current development efforts are focused in four areas of the country. The company is targeting the resource potential of the Bakken Shale of North Dakota, Cana Woodford of Western Oklahoma, oil prospects in Utah, and the South Texas Eagle Ford Shale.